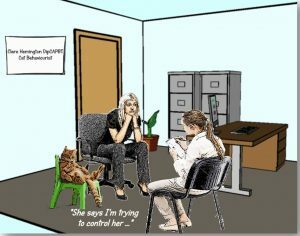 ​Relatively little is still known about cat behaviour and even less about the existence of cat behaviourists, so I thought I’d share with you what happens on one of my consulting days. In order for Ronaldo to stop thinking of Stacey and James’s bed as a toilet, it was important to deny him access to the bedroom at all times for an indefinite period. This was a slightly contentious strategy as Stacey loved having Ronaldo cuddle up to her at night, much to James’s obvious annoyance. In order to restore harmony to the bedroom, I suggested treating Ronaldo to a lovely low-voltage heat pad and placing it in a favoured spot downstairs where he would have access to all his other essential resources, including his food, water, toys, scratching post, litter tray and a Pet Remedy plugin diffuser to help keep him nice and relaxed. They were to create a new and consistent night time routine for him that involved a late meal in his night time area, and switching on the heated pad to signal bed time. In this way, Stacey could relax in the knowledge that Ronaldo would be enjoying his new cosy set-up, and James would be happy having Stacey cuddling him instead of Ronaldo!